Do you wish you had your very own garden, but are limited on space for planting one? The Felknor Topsy Turvy Tomato Tree from Today’s Concept can help! This space saving design is perfect for apartments, decks, townhomes, or any area that has a limited availability for planting. Plant three separate plants in one Felknor Topsy Turvy Tomato Tree and watch them grow! This item is perfect for tomatoes, zucchini, squash, and more. Fresh herbs have also been known to thrive in this innovative growing center. 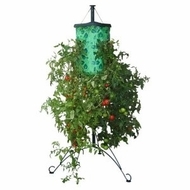 Easily assembled, the Felknor Topsy Turvy Tomato Tree comes with its own stand for convenience. Just a few steps from your kitchen door, on a patio or deck, you can now plant three different tomato varieties. This tree of tomatoes will grow five feet in diameter, six foot high, and yield between 150 and 200 tomatoes (based on average yields). If you grow the cherry-type tomatoes, the yield will be hundreds and hundreds of delicious salad tomatoes. Mix and match tomatoes (for instance, one yellow, one red, one cherry size, etc.) You can even grow fresh herbs, zukes, eggplant or a variety of peppers.